Venus is often called Earth’s twin because it is the closest planet in size to Earth. Scientists estimate the diameter of Venus at about 7,520 miles, making it approximately 400 miles smaller in diameter than Earth. Although it is called Earth’s twin, the surface conditions of Venus are very different from those on Earth. Scientists believe the planet’s surface is very hot and dry and contains no liquid water, due to extremely high surface temperatures. Ancient astronomers called Venus both Phosphorous and Hesperus, mistakenly believing that the object visible in the morning and evening were two separate celestial bodies. The planet was later named Venus after the Roman goddess of beauty and love. Venus travels around the sun in a nearly circular orbit, with its average distance from the sun varying only slightly throughout the orbit. It takes the planet approximately 225 Earth days to travel completely around the sun, compared to Earth's 365 days. With its faster orbit around the sun, Venus overtakes Earth every 584 Earth days, changing from an evening star (visible after sunset) to a morning star (visible before sunrise), and then vice versa. Venus is one of only two planets that rotates on its axis clockwise from east to west. The only other planet to do so is Uranus. When seen from Earth, Venus is brighter than any other planet or any star in the sky. At certain times of the year, it is the first planet or star visible in the western sky at night—and at other times, it is the last planet or star visible in the morning. Venus is constantly covered by thick clouds of sulfuric acid, through which no visible light can penetrate. For this reason, astronomers have been unable to view the planet’s features through optical telescopes. Most of the knowledge about Venus’ surface has been gained through radar images acquired from U.S. and Soviet space probes. Approximately 65% of Venus’ surface is covered in flat, smooth plains, and the remaining 35% is made up of six mountainous regions. The mountain range Maxwell, which is about seven miles high and 540 miles long, is the highest feature on the planet. 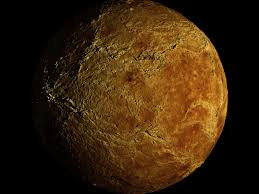 Venus has far fewer impact craters (created when a planet and an asteroid collide) on its surface than Mercury, Mars, and Earth's moon, leading geologists to believe that the current surface of the planet is less than one billion years old. The atmosphere of Venus is heavier than the atmosphere of any other planet. It is made up primarily of carbon dioxide and exerts an estimated 1,323 pounds per square inch (psi) of pressure on the planet, roughly 90 times more pressure than Earth’s atmosphere. Venus’ high surface temperature is a result of the greenhouse effect. Because of the large clouds of sulfuric acid surrounding the planet and its thick atmosphere of carbon dioxide, nearly all of the radiant energy from the sun that enters the atmosphere is trapped and held at the planet’s surface. The force of gravity on Venus is slightly less than gravity on Earth. A person weighing 100 pounds on Earth would weigh approximately 88 pounds on Venus. Due to its slightly smaller size and its lower density, Venus' mass is about 80% that of Earth. Venus was first observed from space on December 14, 1962, when an unmanned U.S. spacecraft called Mariner 2 passed within 21,600 miles of the planet after traveling through space for 3½ months. It was the first of all the planets (with the exception of Earth) to be seen from space. The first spacecraft to successfully land on Venus was the Soviet spaceship Venera 7, which reached the planet’s surface on December 15, 1970. Several spacecraft had gone near the surface prior to this date, and the Soviet Venera 3 had crashed into the planet in 1966. Until quite recently, Venus had been visited by more space probes than any other planet (Mars has now been visited more), with 18 Soviet and six American spacecraft making the trip. Venus is currently being explored by the Venus Express spacecraft launched by the European Space Agency in November of 2005. The mission has been extended several times and is planned to remain on Venus until December of 2012. The average temperature on Venus’ surface is about 870° Fahrenheit, making it the hottest planet in the solar system and hotter than most ovens. While astronomers are unsure whether any form of life exists on Venus, it is highly doubted. Due to the incredibly hot temperatures on the planet’s surface, none of the plants or animals that live on Earth could survive on Venus. Venus is the second planet from the sun and the closest planet to Earth. The distance between Venus and Earth varies from 23.7 million miles when the planets are closest together to 162 million miles when they are farthest apart. Geologists believe that Venus once had large bodies of water on its surface, similar to those on Earth, which dried up approximately 300 million years ago as the sun began emitting greater amounts of solar energy. Because Venus is only slightly tilted on its axis, it has no real seasonal variation in temperature as does Earth—it is simply baking all the time. Scientists believe Venus was formed largely by volcanic processes, due to the large amount of volcanoes, lava flows, craters, and ridges which make up the planet’s surface. In 2007, images and data from the Venus Express spacecraft were able to confirm that lightning occurs on Venus and that the phenomenon is more common there than on Earth. Prior to the 1970s, there was vast speculation among astronomers about the nature of Venus’ surface. Many scientists believed the planet would be quite tropical, and the first Soviet spacecraft sent to the planet was loaded with equipment to confirm the presence of water.